This product type is not available. 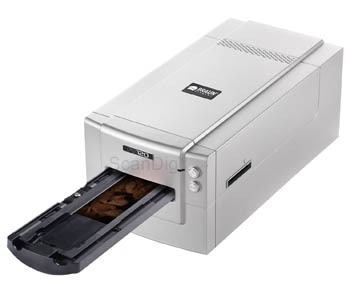 The Braun FS 120 is a high-class filmscanner both for medium formats and for 35mm films. The FS 120 can process medium format films (120/220) in the sizes 6x4,5, 6x6, 6x7, 6x8, 6x9, 6x12 and 6x14 cm (positives and negatives). You can insert and scan medium format films up to a length of 6x22cm into the standard medium format film holder. The advantage is, that you don't have to cut film strips with e.g. three 6x6 pictures. You only have to rotate the film strip by 180° after scanning. 35mm films can be scanned either as mounted slides or film strips. In the standard delivery content there are 3 film holders, in which the film material is inserted. In the medium format film holder there can be films inserted with a height of 6 cm up to a width of 22 cm. 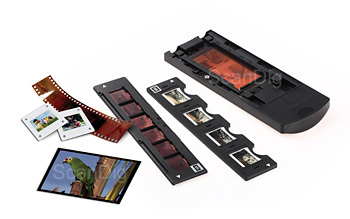 In the 35mm slide mount holder up to 4 mounted slides can be inserted; in the 35mm film strip holder there can be inserted film strips (negatives or positives) up to a length of 6 frames. Since the scanner does not have an automatic film strip transport only the actually over the sensor positioned image can be scanned; after each scan the film holder has to be moved to the next position manually. As you can read in our detailed test report about the Braun FS-120, the Braun FS-120 scans with a nominal resolution of 3200 dpi and achieves (exceeds) this resolution also in practice (measurement with our test device). So it is the first film scanner which achieves in practice 100% of that, what the manufacturer promises - an excellent quality feature. 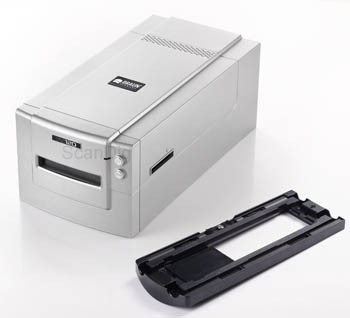 Also notable is the very high scan speed of the Braun FS-120, so that you can digitize large amount of 35mm films or medium format films in an acceptable time. 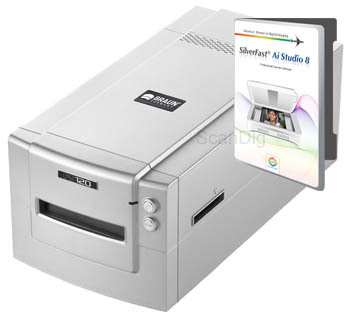 In order to get a very good image quality you should operate the FS 120 with the professional scan software SilverFast Ai Studio and do an IT-8 color calibration before scanning. Please, choose above, below the price information, between the SilverFast Ai Studio version and the SilverFast Archive Suite (Archive Suite = SilverFast Ai Studio + SilverFast HDR Studio). Also, please, choose above your desired targets (Kodak, Fuji, Kodachrome) for the IT-8 colour calibration. Detailed information about SilverFast and the available targets can be found on our SilverFast website. Information about SilverFast HDR can be found on our SilverFast HDR website. Information about scanner calibration can be found on our page Scanner IT-8 calibration. Please, choose above, below the price information, if you want to order the scanner with or without Adobe® Photoshop® Elements. The Braun FS 120 with SilverFast Ai Studio is the best scanner+software combination at the moment for scanning medium format films in a very good image quality and very fast, at least if one considers the price-performance ratio. No flatbed scanner provides a similar image quality as the FS 120. Also the competing models Reflecta MF-5000 and Plustek OpticFilm 120 are inferior to the Braun FS 120. If you have professional demands concerning image quality you should take a Hasselblad scanner or a Nikon Super CoolScan 9000 ED. Scan time: 3200 dpi, 24 Bit = 200 Sec. The new SilverFast 8 Preview Concept allows to assess the results even for complicated image optimization functions, such as iSRD and USM, at any time. A 100% zoom facilitates to properly evaluate and set the parameters of these tools. The user interface of SilverFast 8 has been completely redeveloped according to current standards. The controls can be arranged flexibly and freely on the screen according to personal preferences. All major functions can be operated quickly and easily. SilverFast 8 is fully capable of multitasking. For example, if several originals are to be scanned one after another, the user can already set the image optimization options for the second scan while the scanner is digitizing the first original. SilverFast SCC is a tool to perform a selective color correction in a very simple manner. Selective color correction means that a single color is selected and changed specifically, but all other colors remain unchanged. A mouse click in the preview window easily selects the color to be changed: SilverFast's Selective Color Correction is particularly intuitive. The Global Color Correction is an intuitive tool for controlling the color balance of the whole image. Particularly older images often show color casts that can be removed easily with GCC. The possibility to restrict modifications to half and quarter tones, allows effortless optimization of even those color shifts that are only visible in the very light or very shadowy image areas. The WorkflowPilot is a wizard that guides the user in the correct order through all required processing steps. Depending on material and intended purpose there is a different workflow that will be worked on with the WorkflowPilot step by step. SilverFast HiRePP will dramatically speed up the process of loading and working large image files. SilverFast 8 supports Photoshop CS3 to CS6 and CC. SilverFast 8 supports Photoshop Elements 8 to 13. SilverFast 8 can also be installed on Windows as a TWAIN module. Note: SilverFast 8 is Intel native software and thus it is not available for PowerPC Mac systems (Those G4-microprocessors were only produced until the End of 2005). When working with film strips it can often happen that you accidentally touch the emulsion side of the film. The damage often is irreparable. You can avoid damages to the film material and comfortably insert film strips into the scanner or film holder by wearing fine cotton gloves. Anti-dust spray is used to clean film material - no matter if it's mounted slides or film strips - by removing dust and fluffs with a flimsy current of air without touching the film material at all. There is no better, more comfortable and more efficient way to clean your film material. For working with single negatives or positives we highly recommend using tweezers, because otherwise you run the risk of touching and damaging the film. Those who work with digital images - no matter if they come from a digital camera or from a film scanner - should absolutely calibrate their screen. Without a screen calibration performed with objective criteria you run the risk of wrongly adjusting the settings of the scan or the image editing software, which makes the image look right on your screen, but will cause unnatural alienated colours on other output devices (printer, image service, new screen). Copyright ScanDig. All rights reserved. Drag products here or use the corresponding buttons [Buy now] in order to fill your shopping cart.